While a man hunt is underway to apprehend the Israeli killers of 18-month old Ali Dawabshe, the Palestinian baby burned to death in a settler arson attack last Friday, for the past two nights more than one hundred Israeli soldiers and Shin Beit security officials have raided the homes of the Dawabshe family in the West Bank village of Duma near Nablus. Speaking to Mondoweiss via telephone, Nasser Dawabshe, an uncle of the deceased, said that at 2:00 am Wednesday morning 30 Israeli army Jeeps with approximately 150 soldiers arrived in Duma. He said they woke sleeping members of the Dawabshe family, removed them from their houses, and searched the buildings until around 4:30 am. “I was on my way home when I saw the Jeeps,” Nasser Dawabshe said, explaining that he attempted to hide, but Israeli border police noticed him and approached. “The actual soldiers, themselves, treated us like s**t, but the commanders and the generals and the intelligence service were more respectful,” he said. Nasser says the security forces asked him what he thought of Palestinian prisoners in Israeli jails. Based on the line of questioning Nasser suspected the raid was to determine if any family members were considering retaliatory attacks against Israeli civilians. Earlier this week the Dawabshe family opened their homes to more than 100 Israelis from the group Tag Meir, an anti “price tag” group that protests attacks on Palestinians carried out by Israeli extremists. Nasser also spoke at a Israeli demonstration in Tel Aviv against the killing of his nephew, sharing the stage with Israeli opposition leader Issac Herzog and head of the leftist Israeli political party Meretz, Zahava Gal-On. According to Nasser, the Israeli military returned to Duma Wednesday night. The military parked around 20 Jeeps at a nearby settlement and then walked through the steep West Bank hills to the Palestinian village. 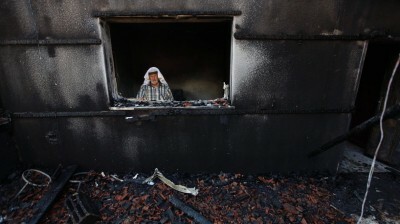 In this overnight incursion the soldiers closed off the charred home of Ali Dawabshe. The Israeli Defense Forces (IDF) spokesperson office was reached for comment but a spokesperson said she was unable to give a statement on the raid while the investigation to apprehend those responsible for the killing is ongoing. In the immediate hours after the attack in Duma, Israel announced it would treat the killing as “an act of terrorism.” Israel then upgraded its investigative efforts this week by employing “administrative detention,” a emergency powers order to jail suspects without arrests or trail. The first arrest of known leaders of Jewish extremists groups was made Monday when Meir Ettinger, 24, the grandson of extremist rabbi Meir Kahane who advocated for the use of violence against Palestinians, was taken into custody. On Tuesday Israel approved the administrative detention of three additional extremists.